The clock and bell tower. The clock section and the tower originally held an observatory. The statues were cut from 30 ton blocks of granite. Colossal figures of Justice, Mechanical Arts, Agriculture, and Commerce. 9' diameter clocks: originally illuminated by gas jets. This building stands on the site of the Franklin Square Cemetery, Buffalo's second burial ground from 1804 to 1836, especially for soldiers of the War of 1812. (The first burial ground was east of Washington Street, above present Exchange.) In October, 1836, a brick wall was built around Franklin Square on the Eagle, Delaware and Church street sides, at a cost of $2,000, paid for by popular subscription. At that time, all the graves not marked by stones or monuments were leveled and graded even with the general surface. Many a resting-place of early residents, and of soldiers of 1812, was thus lost for identification. In 1851, the city bought the property of H. E. Howard, 95 by 115 1/2 feet, at the northwest corner of Church and Franklin streets. It was used for Mayor's office and other city offices until shortly before the completion of the present building in 1876. In 1857, when Seth Grosvenor bequeathed $40,000 to the city of Buffalo for a library, $10,000 of which was to be used for a lot and building, old Franklin Square was strongly, but unsuccessfully, advocated for its site. Designed by perhaps Rochester's greatest architect, Andrew Jackson Warner, it is an outstanding example of High Victorian Romanesque. Warner was the supervising architect for Richardson's Buffalo Psychiatric Center (formerly Buffalo State Hospital), but his Romanesque style is quite different from Richardson's, although the buildings were constructed about the same time. Richardson has pointed turrets at the corners of his towers, for example, instead of the colossal female figures of Justice, Mechanical Arts, Agriculture, and Commerce that Warner uses. 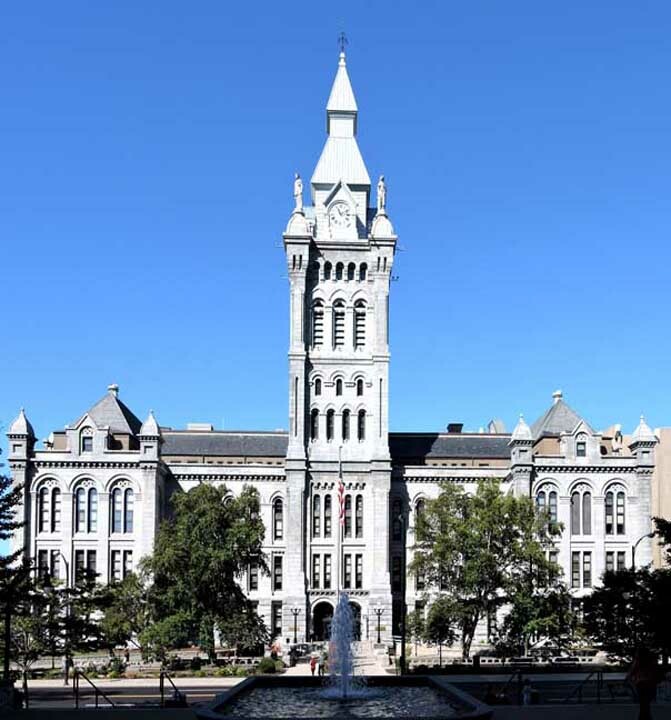 Rochester's City Hall, also designed by Warner, is quite similar to Old County Hall. Warner's Academy Building in Rochester, with its contrasting colors, is more typically Victorian. According to Richard o. Reisem in Classic Buffalo, Warner described the style as "Norman", the term referring to Romanesque architecture in England. Regardless of the subtype, the tall tower and rounded windows and entrance mark this as Romanesque. On the inside, only the registry of deed room, with its tall, cast-iron columns decorated with incised ornament, survives unchanged from Warner's time. The rest of the interior was thoroughly remodeled in 1925 by Harold Jewett Cook, a local architect well known for his many bank designs, into a rather typical example of "Bureaucratic classical." "Designated Landmarks of the Niagara Frontier," by Austin M. Fox. Buffalo: Meyer Enterprises, P.O. Box 733, Ellicott Station, Buffalo, New York 14205. 1986.